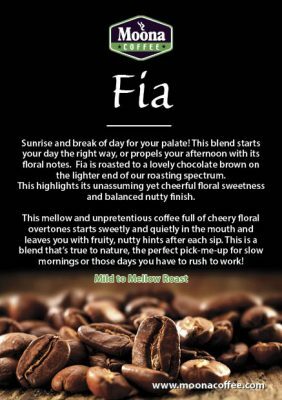 Coffee lovers out there, meet Zia – the ultimate dark roast coffee blend by one of the most bespoke coffee houses in the UK: Moona. That’s right – you can now order a freshly roasted bag of dark roast coffee, either ground or beans, right from the comfort of your home or even couch. As you might expect from an established coffee seller like Moona, Zia is nothing but a full-bodied and delightfully sweet coffee that’s perfect for any time of the day. What Goes Into Zia Blend? Moona in-house blenders have certainly mastered the art of coffee roasting and blending. They brought together the winey full bodied Kenyan and Ethiopian beans and the soft floral sweet-scented Guatemalan coffee to complement the delightful herbal sweetness of New Guinean coffee, coming up with a blend with intensified flavours and body while completely removing any hint of smokiness. Impressive, right? Even better, the resulting blend is a slice of heaven for those who prefer to brew with a cafetiere. There’s no question volcanic highlands across the world – from the sprawling Mt Kenya to those dotting the New Guinea and every highland in between – produce highly potent and sizzling (in terms of flavours) coffee beans. It’s for this particular reason that master blenders at Moona Coffee see to it that Zia comprises only the beans from world-renowned volcanic highlands. There is only one proven way premium coffee can be produced for the best drinking experience – artisan hand roasting. 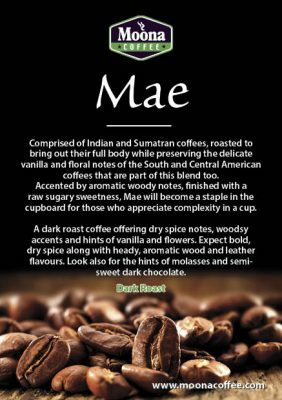 Don’t get fooled by the much-hyped machine roasted coffees which are processed and masse with little or no attention to retention of flavours, body, acidity and elimination of smokiness. At Moona Coffee, all coffee blends are hand-roasted by experts with longstanding experience in the trade. That means your coffee is selected, blended, and roasted to perfection by someone who knows what “good” coffee really is. Again, Moona uses in-house coffee blending experts who leverage many years of expertise to ensure that only premium coffee is delivered to customers throughout the region. But that isn’t all they are interested in when selecting the beans. 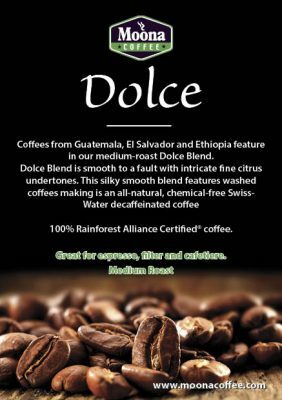 They don’t just go for any volcanic highland coffee; they go for 100% Rainforest Alliance Certified coffee. This way, you can rest assured knowing coffee is ethically sourced and doesn’t pose any threat to our already devastated rainforest. 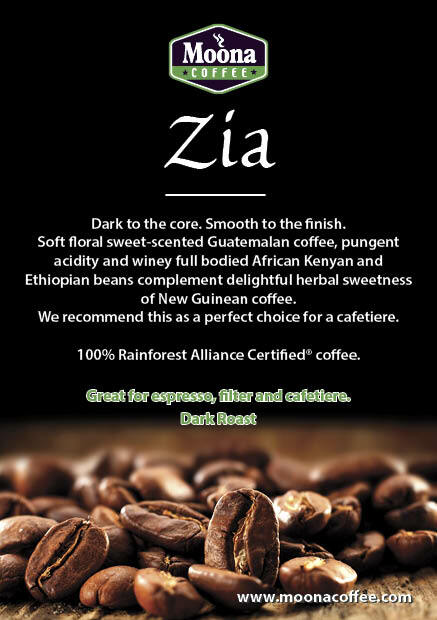 Zia Blend is a 100% Rainforest Alliance Certified® coffee.